In this month’s newsletter I am pleased to share with you our 2014 Annual Report. Within the last year, AIP Foundation further developed effective programs that provide life-saving skills to vulnerable road users, strengthened relationships with governments to advance progressive legislation, and promoted the road safety dialogue to nationwide audiences. We saw increased helmet use rates across our project schools and an expansion of our programs to reach additional communities. AIP Foundation attended the Fourth Global Meeting of Nongovernmental Organizations Advocating for Road Safety and Road Victims in Marrakech, Morocco. The objective of the meeting was to encourage and facilitate members’ involvement in important road safety key events, such as the Third UN Road Safety Week in May 2015. At the meeting, AIP Foundation presented posters on specific projects in Thailand, Cambodia, Vietnam, and Tanzania. View AIP Foundation’s posters here. 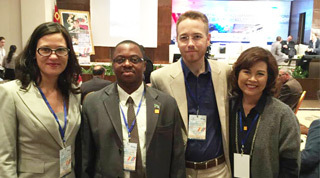 AIP Foundation and the US CDC’s Global Road Safety team received the National Center for Injury Prevention and Control’s Honor Award this year for “International Partnership.” The award recognized AIP Foundation and CDC’s collaborative work on the Global Helmet Vaccine Initiative in Cambodia. The NCIPC Honor Awards celebrate the best of public service by recognizing the outstanding, talented, and dedicated staff of CDC and their partners for their contribution to improving public health and injury prevention. As the award winner for the Center, the partnership was also nominated for a CDC-wide award at the 63rd Annual CDC & ATSDR Honor Awards ceremony held on March 24, 2015. Awards recognized two major areas of US CDC accomplishment—science/program and management/operations. The public service announcement “Love your child. 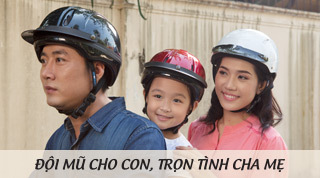 Provide a helmet.” developed by AIP Foundation, is now airing in Vietnam. The TV commercial, produced with financial support from The UPS Foundation, reminds parents that they are responsible for educating children on safety and addresses the indifference parents exhibit around child helmet use. As part of the campaign, AIP Foundation is counting down to April 10, 2015, when traffic police and public security forces will begin to strictly fine violators of the child helmet mandate. A total of 9,100 helmets will be distributed to primary students and teachers throughout 2015 as part of Johnson & Johnson’s fourth year of support for AIP Foundation’s road safety program, Helmets for Kids. 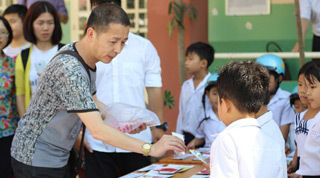 Between February and December of this year, 44 schools will receive donations in Ha Tinh, Quang Binh, Dong Nai, and Quang Nam Provinces. 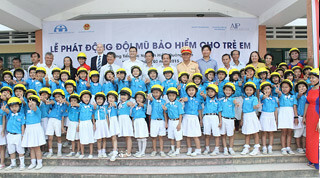 AIP Foundation organized a kick-off ceremony on March 17 in Quang Nam Province to mark another year of support. 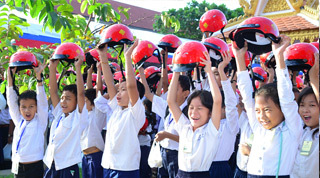 This is the first year Quang Nam Province schools are receiving helmet donations and road safety education under the Helmets for Kids program. 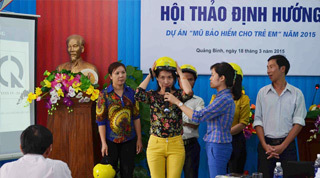 AIP Foundation organized a Helmets for Kids orientation workshop supported by Johnson & Johnson in Quang Binh Province, where 63 participants discussed and agreed upon project activities. Representatives of project schools were invited to the stage to demonstrate the three steps to wearing a helmet correctly and attendees were reminded how to check and monitor crash cases at schools. The Photovoice project utilizes photos and reflections from students as a way to educate them on pedestrian safety and advocate for better walking environments. This month, FedEx Express and AIP Foundation/Safe Kids Vietnam announced the semi-final winners of the project at an event with more than 200 participants. Activities will culminate in May with a final workshop held during The Third UN Global Road Safety Week, themed “children and road safety,” where students will present the current walking environments, proposed modifications, and the results of mobilizing their friends, parents, and local community to support their suggestions for improved environments. 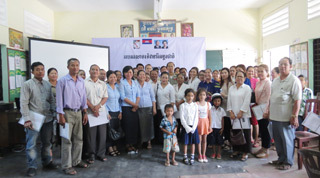 In support of International Women’s Day, AIP Foundation organized a “Mothers and Helmet Use” forum at Anuk Wat Primary School on March 5. 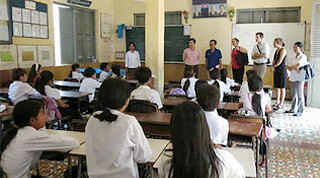 The forum is a vital part of the Helmets for Families project, sponsored by Manulife (Cambodia) Plc. Mothers received information on the impacts of road crashes on society and their families, the relationship between injury prevention and helmet use, and their role in encouraging helmet use among family members. In addition, more than 1,200 parents of students from the 18 “Head Safe. Helmet On.” target schools supported by USAID-DIV in Phnom Penh, Kandal and Kampong Speu Provinces joined road safety trainings in late March. These trainings highlighted the benefits of parental enforcement of correct helmet use for families and communities and discussed the active role parents play in ensuring children always wear helmets on motorcycles. Read more about the “Mothers and Helmet Use” forum here. 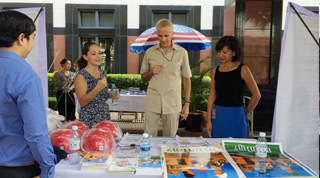 AIP Foundation in Cambodia participated in the United States Embassy’s Eighth Annual Health Fair in Phnom Penh, which focused on health promotion initiatives related to healthy lifestyles and disease prevention. AIP Foundation was invited by the US Embassy to be a stall-holder at the fair to promote motorcycle helmet use. The booth displayed helmet awareness and educational materials, Protec helmets, benefits of the Cambodian passenger helmet law, and information on the “Head Safe. Helmet On.” project. Approximately 700 people attended the Health Fair, with many expressing their interest in the work of AIP Foundation and road safety in Cambodia. In order to more effectively enforce the recently approved Road Traffic Law, 14 Cambodian traffic police from provincial, district, and national levels visited Vietnam to discuss best practices in road safety. Coordinated by AIP Foundation with financial support from FIA Foundation, the tour is part of the USAID-DIV-funded “Head Safe. Helmet On.” project in Cambodia. Traffic police representatives met Vietnam’s Traffic Safety Committee and Traffic Police to hear their experiences and lessons learned on helmet legislation and traffic law enforcement, focusing specifically on passenger helmet use enforcement at a district-level. Upon their return from the tour, Cambodian traffic police shared experiences and lessons learned at a district-level passenger helmet enforcement action plan workshop. In support of the new Road Traffic Law, 18 primary schools across Kampong Speu, Kandal, and Phnom Penh Provinces are taking part in a new initiative to encourage helmet use in and around school communities. The two-year “School of Excellence in Helmet Use” project, supported by The UPS Foundation, allows schools to compete for the title of “Road Safety Champions” by making outstanding efforts in promoting helmet use. Upon completion, three winning schools will be awarded with a study tour to Vietnam to discuss best practices in school-based road safety initiatives. On 10 February, AIP Foundation in Thailand met with the Deputy Governor of Bangkok, Dr. Pusadee Tamthai, to discuss The 7% Project. 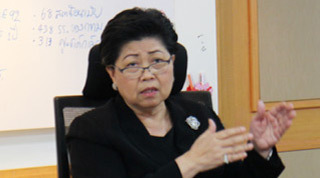 Dr. Tamthai and several officials from the Department of Education expressed their support for the project and intend to include helmet wearing instructions into the school curriculum. A Walk Rally took place at Suan Luang Rama IX Park to promote helmet use and road safety awareness among students and youth. 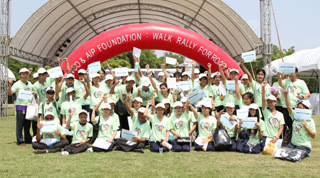 The “Walk Rally for Road Safety” was organized by AIP Foundation in cooperation with Thai DENSO Group and Road Safety Fund and serves as a space for children to come together and engage in road safety educational activities. Upon arrival at the Walk Rally, each participant received a road safety “passport” and were asked to join a team. 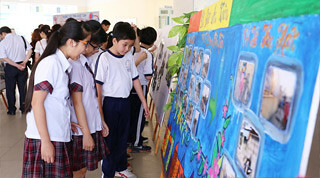 Teams had to visit a total of six road safety game booths in order to collect stamps in their passports and receive a prize. 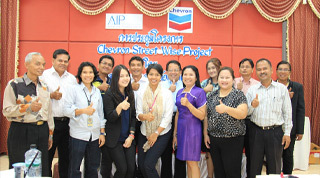 AIP Foundation conducted a stakeholder meeting this month with for Street Wise, AIP Foundation’s project in Thailand supported by Chevron. Partners included representatives from Chevron staff, school directors, Street Wise teacher coordinators, traffic police, educational officers, officers from Muang Municipality office, and key organizations involved in road safety in Songkhla Province. Participants discussed Street Wise baseline survey results and began planning for upcoming activities under the project. Street Wise focuses on both pedestrian and helmet safety in six project schools in Muang and Singhanakhon Districts. 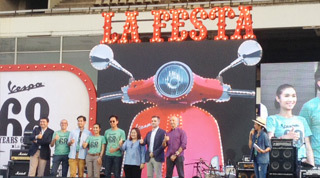 On March 14, a caravan of approximately 3,000 VESPA riders drove to the Royal Turf Club of Thailand, where a “68th YEAR OF VESPA: LA FESTA” festival took place. The festival not only celebrated 68 years of Vespa, but children’s motorcycle safety. Each count of Vespa or Piaggio scooter joining the caravan was turned into one helmet to be donated by Vespiario (Thailand) Co., Ltd. to AIP Foundation’s Helmets for Kids program. The event featured a carnival, shops, activities, a road safety booth organized by AIP Foundation, and concerts. 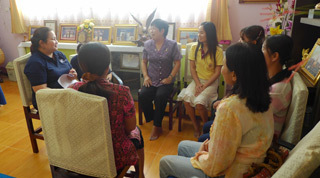 AIP Foundation met with Nong Samrong Wittaya and Nakwang Pattanasuksa Schools this month to discuss the Helmets for Kids program, supported by Vespiario (Thailand) Co., Ltd. AIP Foundation held two focus-group discussions and four in depth-interviews with school principals, teachers, and parents to discuss school implementation. 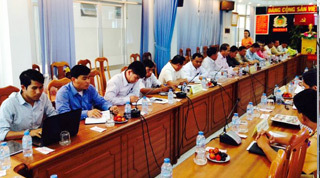 AIP Foundation met with the Udon Thani Road Safety Committe organized by Udon Thani Provincial Transportation Office. 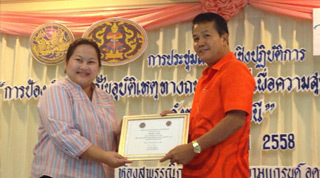 The Deputy Governor of Udon Thani presented AIP Foundation and Helmets for Kids project schools Chumchon Nakwang School and Nong Samrong School with Certificates of Appreciation for significantly increasing students’ helmet wearing rates. 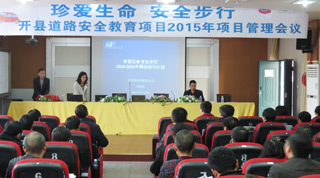 AIP Foundation in China organized a meeting with stakeholders of the Walk Wise project supported by Chevron to share the previous school semester’s lessons learned and prepare major project tasks for the current Spring semester. In attendance were principals and road safety directors from 37 Walk Wise project schools along with representatives from education and traffic police departments. AIP Foundation in China organized a study tour for Walk Wise stakeholders to visit AIP Foundation in Ho Chi Minh City, Vietnam. The participants included delegates from the Kai County Education Committee, Kai County Communist Youth Union, Kai County News Agency, Kai County Coordination Office, and project schools. The objective of the trip was to improve the ability of the partners to implement and advocate for road safety programs in Kai County, China. An important aspect of addressing boda boda (motorcycle taxi) helmet use and road safety in Uganda is targeting enforcement systems and actors which influence boda boda operators. The Uganda Helmet Vaccine Initiative, under which AIP Foundation operates in Uganda, has incorporated activities to address helmet use enforcement by partnering with the Uganda Police Force to conduct 21 helmet checkpoints across Kampala. 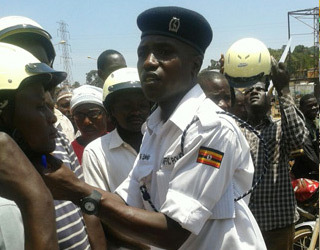 Drivers are stopped and those who are compliant with motorcycle regulations as provided in the Traffic and Road Safety Act are awarded with a free helmet. 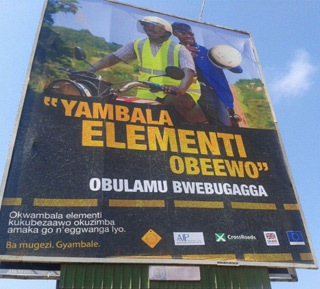 The Uganda Helmet Vaccine Initiative (UHVI) is further promoting boda boda (motorcycle taxi) helmet use through radio commercials, radio program sponsorship, DJ mentions, billboards, and other signage through April, 2015. UHVI utilized post-evaluation results from previous phases of the campaign to select four radio messages with the highest recall along with radio stations with the largest reach. Radio commercials will be aired 800 times. Furthermore, three radio programs are airing talk shows led by a panel of organizations, medical practitioners, and academic representatives. UHVI is engaging with local celebrity Bobi Wine as the campaign ambassador. 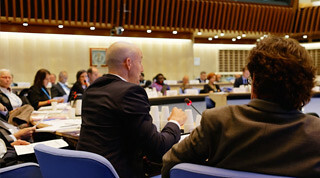 The Honorary Chartered Institute of Logistics and Transport (CILT) International Ambassador, Dr. Harrison Mwakyembe, quoted Global Road Safety Partnership figures, which indicate that 3,500 people die on roads every day, while Africa has the highest road fatality rate of all the continents despite having fewer cars on its roads by comparison.